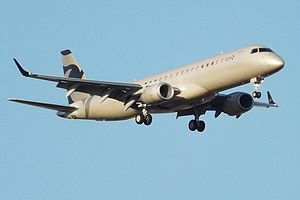 The Embraer Lineage 1000 is a variant of the Embraer 190 regional jet airliner, launched as a private jet on May 2, 2006. Manufactured by the Brazilian aerospace firm Embraer, the Lineage is advertised as an "ultra-large" business jet with comfortable seating for 19. The Lineage 1000 is largely based on the successful Embraer passenger jet, the Embraer 190, with added fuel tanks in the lower deck cargo hold space, nearly doubling the jet's range. It boasts a lavish interior, divided into up to 5 sections including an optional bedroom, washroom with running water, and a walk-in cargo area at the rear. Its fuselage cross-section is larger than similarly priced business jets like the $50.4M Global 5000, $53.8M Falcon 7X or $54.5M Gulfstream G600, but smaller than other airliner conversions : the Sukhoi Superjet 100, B737-based $71.4M Boeing Business Jet-1 or A320-based $87.0M Airbus Corporate Jets319. The Lineage 1000 received its certification from Brazil's ANAC and from EASA in December 2008. It was certified by the USA Federal Aviation Administration on 7 January 2009. The first Lineage 1000 was delivered to HE Aamer Abdul Jalil Al Fahim on May 7, 2009. In October 2013, Embraer introduced the Lineage 1000E, which delivers greater range - 4,600 nm (8,519 km). In addition, the new Lineage 1000E features new in-flight entertainment and cockpit options. ^ Warwick, Graham (20 November 2007). "Picture: First Embraer Lineage 1000 arrives for completion". Flightglobal. Retrieved 14 April 2008. ^ a b "2017 Annual Report" (PDF). General Aviation Manufacturers Association. p. 17. Archived from the original (PDF) on 2018-04-10. Retrieved 2018-04-10. ^ "Sukhoi business jet". Superjet International. ^ "Embraer Delivers First Lineage 1000 Executive Jet". Deagel.com. 8 May 2009. Retrieved 30 September 2011. ^ "Embraer Executive Jets Introduces the Lineage 1000E" (Press release). Las Vegas: Embraer. 21 October 2013. Retrieved 12 August 2015. ^ "Lineage 1000". Deagel.com. Retrieved 2011-09-30. ^ "Al Habtoor's Lineage 1000 aircraft enters Royal Jet service". Abu Dhabi. WAM. 14 September 2010. Archived from the original on 25 June 2016. Retrieved 18 May 2016. ^ "Conheça os Aviões Executivos da FAB". Airway. 23 October 2015. Retrieved 11 January 2019. ^ Fred George (Aug 23, 2016). "Embraer Lineage 1000E Evaluation Flight Reveals Improvements". Business & Commercial Aviation. Aviation Week. ^ a b c d e f g h i j "Lineage 1000E Brochure". Embraer. 18 November 2015. Wikimedia Commons has media related to Embraer Lineage 1000.